Sat. May 13: Register and pick up your plants! 111 Broad St. E., Corner of Broad & Cedar St., at the Dunnville Country Parking Lot. 7am-noon. 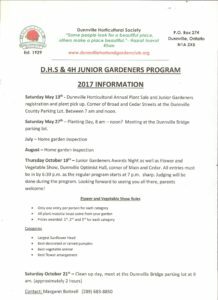 Thursday, Oct. 19: Junior Gardener Awards Night as well as Flower/veggie Show* at the Dunnville Optimist Hall, corner of Main/Cedar St. All entries must arrive by 6:30pm. Program begins at 7pm. Judging to follow. Parents, siblings, and other family members are welcome. Sat. Oct. 21: Garden clean up day! Meet at the Dunnville Bridge parking lot, 9am-11am.